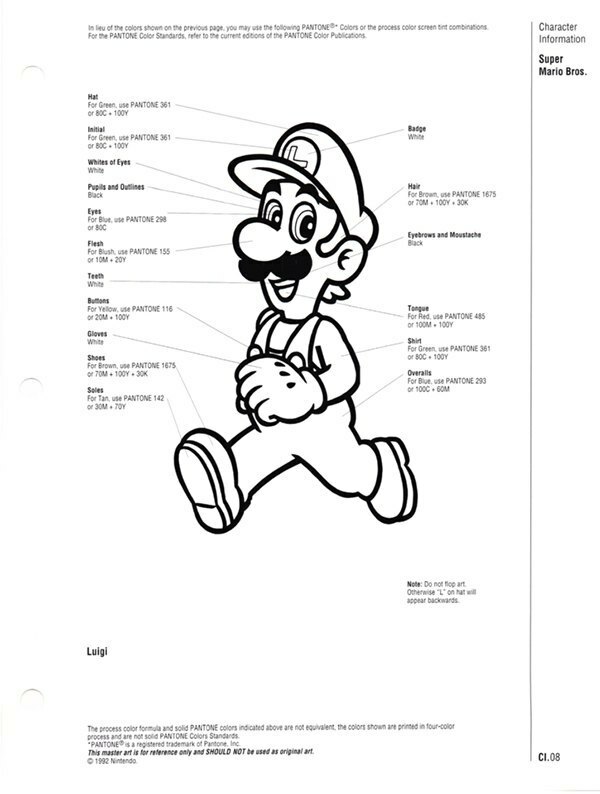 Blake J. Harris, author of Console Wars: Sega, Nintendo, and the Battle that Defined a Generation, has just gifted the Internet with a PDF of Nintendo's official in-house style guide from 1993. While the by-the-numbers definitions on how to color each character would be expected in a document like this, they also feature biographies and clarify misunderstood elements about the history and personality of each iconic hero or villain. It's a small detail for the art department, but Nintendo seems to understand how important it is for its artists to understand the personalities of the characters. Did you know that Wario is not an evil version of Mario and only wants a little respect and maybe an honorary degree in plumbing? Did you know that Pauline, the damsel-in-distress from Donkey Kong, believes that, "life without Mario and Donkey Kong is pretty dull?" You can see Luigi below and the complete, large-scale doc over at Press The Buttons.